If I learned anything last year (2011) it was making soup. While I was working at Bloomfield Farms, I had mountains of produce to play around with. I ventured into all sorts of veggie dishes from stir frying to soups. One of my favorites is a squash soup that uses lime and cashews. You can find the recipe here. 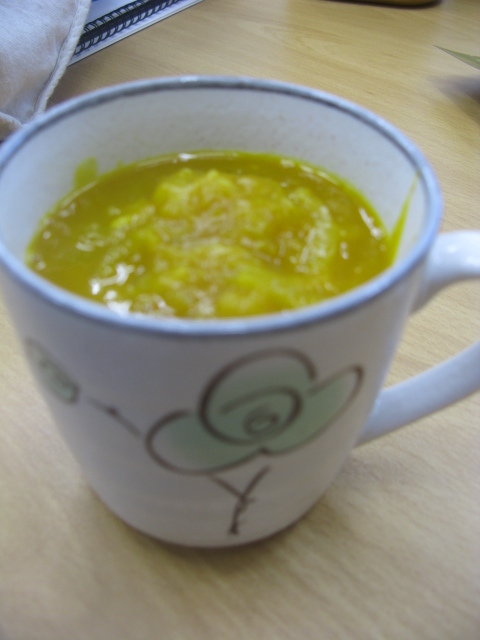 When I saw the squash at the market (and with the help of the recent snow) I thought SOUP! It might have been easy to create the same soup again, however I like a challenge so I set off to create lunch in under an hour with only the thing we already had in the house. First boil water with squash, quartered onion and salt. I was hoping to use boiling water for broth but I ended up throwing out the remaining onions and water. Once squash is soft and cooked put in bowl of cold water to help separate from peel. Put yummy goodness in bowl and set aside. Do a quick rinse of your pot and fill 1/3 with water, in the vicinity of two quarts. As you bring to a boil add chopped onion, apple, garlic, a dash of cinnamon, a dash of cayenne, and a squirt of Bragg’s probably 3 Tablespoons or less. Cover. Let it boil and cook all the veggies. When soft add squash and smash everything together. Enjoy hot!